In 1955, eighteen-year-old Janet Jones keeps the love she shares with her best friend Marie a secret. It's not easy being gay in Washington, DC, in the age of McCarthyism, but when she discovers a series of books about women falling in love with other women, it awakens something in Janet. 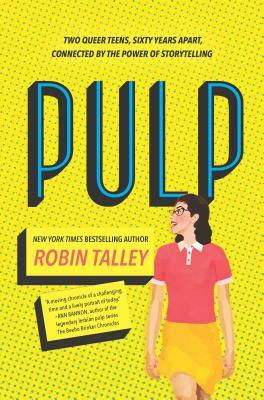 As she juggles a romance she must keep hidden and a newfound ambition to write and publish her own story, she risks exposing herself--and Marie--to a danger all too real.Sixty-two years later, Abby Zimet can't stop thinking about her senior project and its subject--classic 1950s lesbian pulp fiction. Between the pages of her favorite book, the stresses of Abby's own life are lost to the fictional hopes, desires and tragedies of the characters she's reading about. She feels especially connected to one author, a woman who wrote under the pseudonym "Marian Love," and becomes determined to track her down and discover her true identity.In this novel told in dual narratives, New York Times bestselling author Robin Talley weaves together the lives of two young women connected across generations through the power of words. A stunning story of bravery, love, how far we've come and how much farther we have to go.